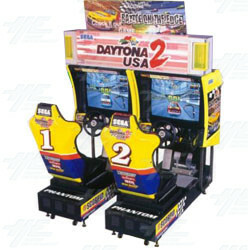 Daytona 2, the sequel to Daytona, is a stock car racing simulator in which the player is placed in a high-speed stock car race in which he can view from multiple angles. The player will have to master the art of power sliding and more in order to gain mastery of the 3 courses. The three courses are Beginner - race 8 laps with 40 cars on a basic oval track, Intermediate - race 4 laps with 20 cars on a tricky amusement park track, and Advanced - race 2 laps with 30 cars on a complex city track. There are 3 different car types, with each car suitable for different skill levels (easy, normal and hard). There are also 3 different race modes - Beat the Clock is a time trial with only the players car racing around the track in an attempt to get the fastest time, Real Players Only mode is where only the participating players cars race, and No Assist mode automatically turns off the 'Auto-assist' feature that speeds up the slower cars in linked play. A new feature to Daytona 2 is the crash impact generator, which delivers shocks to the players back and soles of their feet upon impact. The player will have to master the art of power sliding and more in order to gain mastery of the 3 courses. The three courses are Beginner - race 8 laps with 40 cars on a basic oval track, Intermediate - race 4 laps with 20 cars on a tricky amusement park track, and Advanced - race 2 laps with 30 cars on a complex city track. There are 3 different car types, with each car suitable for different skill levels (easy, normal and hard). There are also 3 different race modes - Beat the Clock is a time trial with only the players car racing around the track in an attempt to get the fastest time, Real Players Only mode is where only the participating players cars race, and No Assist mode automatically turns off the 'Auto-assist' feature that speeds up the slower cars in linked play. A new feature to Daytona 2 is the crash impact generator, which delivers shocks to the players back and soles of their feet upon impact.